We love hearing from our customers who have used the Defy Stains or have questions on prepping and application. We appreciate your input, so feel free to leave a comment below and pictures of your completed projects if you have them. DEFY wood and deck stains contain advanced quality synthetic resins that resist mold and mildew growth, are easy to apply and environmentally friendly. How your Defy stands up to the elements varies though. A stain’s longevity is directly related to the preparation of the wood and how the stain is applied. At DefyStainHelp.com, we want everyone to have to best possible results when using the products we sell. Please give us some details about your wood restoration project. The last Brand of Stain used if any? Please respond to these questions in the comment area below so we may offer some advice and help. Do not over apply. Only apply as much as the wood will allow to fully soak into the grain. Use a staining pad for best application. This way the stain will soak in deeper. Thanks for the prompt and helpful reply. Staining pad it is. We have a large deck and Pergola that has been covered in Sherwin Williams Semi Solid stain. Peeling and terrible. We are currently sanding off the color on the deck – but the Pergola is proving more difficult. Thinking for our main deck we might be able to use the Butternut Semi Transparent -but utilize a Solid stain for the Pergola. Do you have a match for Butternut in Solid? We do not sell solid stains on the website. They have to be custom mixed at paint stores. 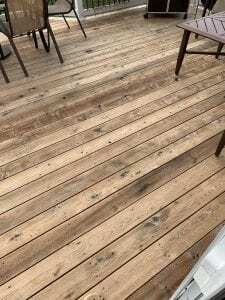 Which is best on cedar decking that has been powerwashed? Hardwood or Extreme? Can you mix cedar tone Hardwood and Extreme? I cleaned, brightened and stain my deck with Defy products (stain was Butternut semi-transparent water based, and I applied 2 coats). It looked beautiful last year, but now that we have gone through winter all of the knots in the wood look like they don’t have stain on them and are white-ish in color. Do you have any tips on how to correct this or prevent it from happening again? Do I re-stain and then put a clear finish on to protect it? Use the Defy Cleaner and reapply one light coat in the same color. You cannot apply a clear os sealer over a deck stain. Hi – I previously used Sierra Silver on my log house. Now that you’ve discontinued that color, what do you recommend? The Driftwood Gray looks similar, I guess, but maybe Crystal Clear would work as well. Clear would not work. Driftwood Gray is closest. Located in Northern Illinois. Deck was built one year ago and am now preparing to stain it. Wood decking is WeatherShield from Home Depot. Is this a one or two coat(s) stain situation? From one are of your website it looks like gallon containers are free shipping. Other verbiage says that only 5 gallon containers ship free. I need approx. 4 gallons. 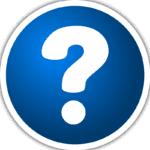 IF there is shipping costs on gallon containers, am I better off ordering 5 gallons with free shipping or 4 gallons and paying for shipping? Also, I used this product in 2015. This is my first reapplication in 2019. I am very pleased with it and how it has held up. My goal is using the cleaner then two wet coats of Defy Clear. Is that the proper path? Clean and then stain is correct. Can the hardwood stain be applied to a softwood like pine? We have a new deck and we are a little confused about whether we need to apply one or two coats of Defy Marine Stain to new wood. We have a railing and the decking to stain. Can you please clarify ? I used your stain for my deck and it looks great. I can’t send you a photo because the deck is still buried in snow. I have a lot of wood siding that a company stained with “Flood stain”. Can I use Defy on my siding? Not over the Flood. When switching brands, you will need to remove the previous coating first. Once stripped and or sanded, brighten all the wood. You can then use the Defy. Follow-up post to add to previous post. The deck was built in 2007. All flooring, posts, railings and spindles are cedar. I am not sure which stain brand was applied previously but I know that it was a semi-transparent stain. Defy is a penetrating wood stain. It cannot peel or wear if it fully soaks into the wood grain as it is designed to do. If it does not soak in fully and dries and cures on top of the wood then one of two things happened during the process. It was not prepped correctly, it was over applied or possibly even both. For more info, please contact SaverSystems at 800-860-6327. No need to sand with the prep. Use the Defy Wood Cleaner while pressure washing. Defy Brightener after. OneTime has numerous issues with curing/drying and does live up to its claims. You can read about this from numerous complaints on the internet. NO Need to SAND ??? Would it HELP DEFY Extreme to SOAK into Wood Better ?? Sanding hinders stain penetration. It does not help it. Can I use the stain/sealer on a chicken coop, both inside and out. i used defy natural pine stain on log cabin siding 3 years ago and need to re stain this year. do i need to use defy oxygenated bleach to remove old stain or can i just stain over top of existing stain? You have to prep when reapplying. Use the Defy Wood Cleaner and light pressure washing for the prep. The Cleaner is not a stripper. We applied the Cedartone on some wood slats for some of our chairs. After a few rains the stain has bleed itself onto the concrete. Do you have suggestions on how to clean this off the concrete? Try a water-based graffiti remover and pressure washing. Sounds like he over applied it and/or did not prep correctly. Strip and brighten at this point for the prep. The Defy Hardwood stain does soak in better for cedar wood in cold weather states. These temps are too cold. Wait until Spring. This spring staining a new log home. What color is 02 in Defy stain? There is not a color called or designated “02”. My garden walls/steps/tree house are made from Home Depot’s brown stained pressure treated lumber. I left it alone for 6 – 12 months to dry out. The brown stain is fading and definitely in need of sun/water protection. It’s a lot of wood so I’m not going to sand it all down to prep. Can Defy be applied as is? Thanks. Last year I completed a clients deck in Alaskan Yellow Cedar. I met with my painting contractor’s tech Rep and they recommended SW Super Deck. The color was great, but It’s lack of penatration was obvious and color could be rubbed off. We are now going to pressure wash and restain deck. Which, if any, of your products would you recommend for Alaskan Yellow Cedar? After applying Defy Extreme to outdoor sanded oak wood furniture, should I apply the defy Sealer for extra protection from south-facing sun at 8,000 foot altitude or is it not needed? Not needed nor can you apply a sealer over the Defy Stains. I am planning on using DEFY semi-transparient on a year old PT deck. I will need about 3 gallons( mabye a little less as the railing are painted). My question: how long will the 5 gallon stain last( still be good to use) after opening. Will it still be good to use the next year? I spilled some defy stain on concrete. I immediately sprayed the area with water. The stain remains. Any suggestions would be appreciated. Not easy to remove from concrete. Try graffiti remover paint stripper and a pressure washer. How long after applying the single coat of stain to my new deck do we need to wait to walk on it and put furniture in place? Night temp about 45 daytime about 70. I recently used Defy products to stain my deck (treated pine), but forgot to do a second coat on the railing. It has obviously dried since applying the first coat. I read all of the warnings about not letting the stain dry before applying the second coat. Do I need to strip and redo the railing or can I simply add an additional coat or some other solution? Thanks for the input. Leave alone for now. In the Spring, lightly wash to remove any dirt and apply the second coat then. It will adhere much better this way. Will the application of multiple coats darken the color as with most stains? 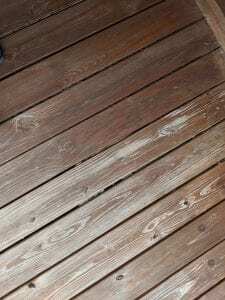 what do you recommend for cleaning Defy stained deck boards? For reapplication, the Defy Wood Cleaner. Just to clean the dirt off, no reapplication. Try warm water and some dish soap. Use a very soft bristle brush like the one you use the wash a car. I just finished staining pressure treated wood deck steps at 4:30 p.m. with Defy Water Based Deck Stain. Should I cover them overnight to protect them from the morning dew? I have a new deck I need to stain. The deck is wood but the balusters in the railings are anodized aluminum (dark gray). Will the wood cleaner and brightener harm the finish on the balusters? What about the stain itself? Will the stain harm the finish? You should avoid getting the prep products and the stain on the spindles. 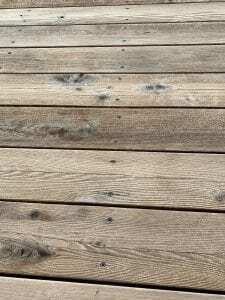 Want to restain a treated pine deck that is about 9 years old. I stained it with Olympic brand stain about 3 years ago. It lasted less than a year. Deck is about 10 ft off the ground and is not covered. What prep do I need to do and once stained what will be needed to maintain? I live in West Virginia and wonder if I should start my project with winter approaching or wait til spring?Thanks in advance for your feedback. You will need to remove the Olympic. Either by stripping and or sanding. Once removed, use the Defy Wood Brightener. You can do this now or Spring. What type of prep is needed for 30 year old exterior cedar lap siding that has been cleaned and stained every 3-4 years with the ACE hardware oil base cedar stain? Siding is in good condition. Post a picture of the siding, please. 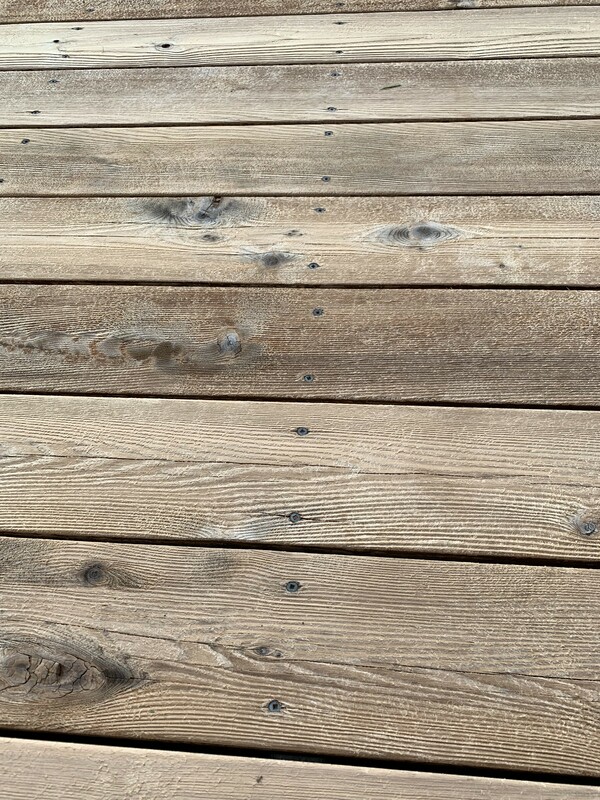 how long do i need to wait between cleaning and pressure washing my treated pine deck and bridge at my fishing cabin before i apply Defy semi transparent stain? I have a PT deck that is about 10 months old. Should 1 or 2 coats be applied? Due to the uneven weathering from the covered to the uncovered area, the only way to apply and have it look even when done is to strip and then brighten. I appreciate the quick response. Do you mean strip the whole deck or just the area under cover that hasn’t weathered like the rest? Wait until Spring would be best. Prep and apply one coat. How to prep will be based on what it looks like in May. I have a Doug Fir porch installed fall 2016. On recommendation of contractor sealed with Pure boiled linseed oil. What a disaster! Parts of it turned BLACK!! Was told about Defy products and cleaned and brightened yesterday (2-15-18) and it looks great. However, some of the boards have a fuzzy appearance now, though they don’t really feel fuzzy. Before we stain with Defy (which product), should we sand? If so, what grit? Rinse or broom off before staining? Lightly sand off the fuzzies using 80 grit. Rinse with water well when done and let dry before applying any stain. I am having to re apply stain every year. would putting 2 coats give me more time in between coats. and can the two coats be applied 5 days apart. western red cedar deck, which product of yours should i be using? defy extreme or defy hardwood?? What climate are you in? im on vancouver island, so typical PNW conditions, hot summers,wet winters. deck is ground level with only 6″ clearance underneath, but 95% roof covered. Use the Defy Hardwood stain. Does Defy stains sell a 1 Quart container. I’m doing some steps with less than 100 square feet. Sorry but only 1 gallons and 5 gallons. I have a 160 sf deck that has spots of peeling solid stain. I tried to use a stripper on part of it that was not peeling and it did not come off. So my thought is to sand. So are these the correct steps? And do I need to wait between each step &, if so, how long? 1. Sand with coarse grit 60-80 grit. 2. Sand again with less coarse grit 120-140 grit. 5. 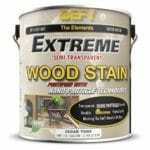 Defy extreme semi transparent stain. 2. No. do not sand finer than 80. All of the solid stain must be removed first with the sanding. Thank you. And the second part of my question is how to wait between each step after the sanding (e.g. does the deck need to dry before moving on between each step)? Thanks! Wait a couple of days after the sanding to clean/brighten. After that is done, wait a couple of days to stain. Just use a cleaner and pressure washing for prep when time to reapply. No. You cannot top coat the Defy with anything. It will ruin the coating and will peel. I put a second coat of cedar tone on my cedar deck 2 hours after the first and the deck looks water stained. Is there a fix for this? If applying two coats it must be applied wet on wet. Not wet on dry. Your first coat most likely already dried/cured and repelled the second coat. The only way to fix would be to remove the stain and start over. Last year we used Defy Extreme – butternut, for the first time on our one year old PT pine deck. Half the deck is covered and half is open to sun/rain. Part of the deck is fading and we’d like to put on another coat. 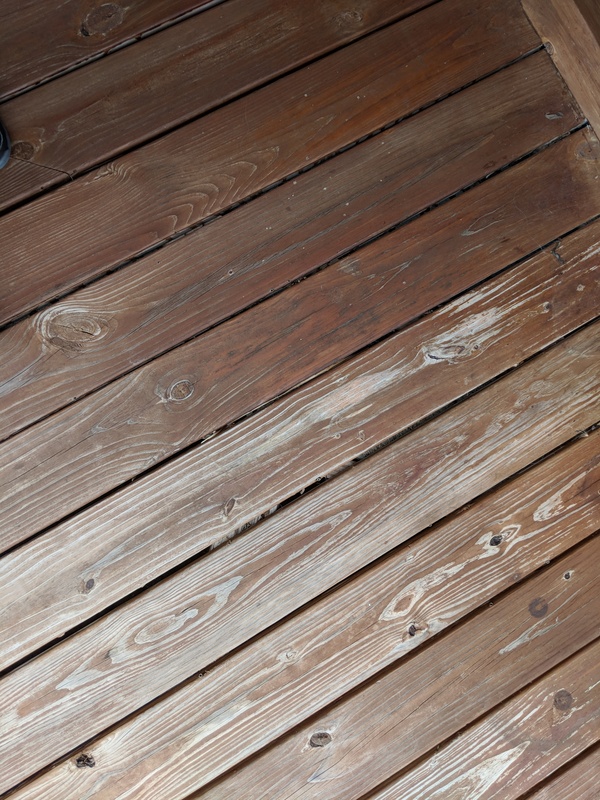 Do we stain the whole deck, or just the areas that need it? Any special prep beyond deck cleaner? Thank you. Unless you have a clear dividing line, it would be best to do all so it looks like it was not “spot” applied. Just use the cleaner for the prep. It will seal for two years but it will gray within 9-12 months. Tinted colors will have 2-3 times longer UV protection.